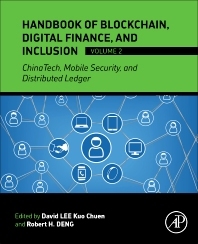 Handbook of Blockchain, Digital Finance, and Inclusion, Volume 2: ChinaTech, Mobile Security, and Distributed Ledger emphasizes technological developments that introduce the future of finance. Descriptions of recent innovations lay the foundations for explorations of feasible solutions for banks and startups to grow. The combination of studies on blockchain technologies and applications, regional financial inclusion movements, advances in Chinese finance, and security issues delivers a grand perspective on both changing industries and lifestyles. Written for students and practitioners, it helps lead the way to future possibilities. 11. Open-Source Operational Risk: Should Public Blockchains Serve as Financial Market Infrastructures? 19. Inclusive Growth as Democratizing Productivity. 22. How 3D Printing Will Change the Future Borrowing Lending and Spending?